Avvicinarsi al castello lungo il lungo viale alberato e tortuoso per la prima volta è come entrare nel passato. Lo stesso parco del castello è un magnifico, 22 ettari di campi, ruscelli e alcuni degli alberi più rari in Francia. Ci sono 8 camere da letto e 5 1/2 bagni. Ogni camera è lussuosamente decorata e piena di pezzi d'antiquariato. C'è un enorme salone rivestito di arazzi con caminetto, due biblioteche, sala da pranzo e una vasta cucina e dispensa completamente attrezzata. La casa è stata restaurata ad un livello molto alto e le camere sono eleganti e confortevoli. Questa casa è perfetta per grandi gruppi, intrattenimenti, matrimoni ed eventi speciali. C'è una piscina di acqua salata lunga 16 metri, progettata per integrarsi con l'ambiente circostante e un grande lago, con kayak, canoa e attrezzature per la pesca, a solo un chilometro di distanza. Gli ospiti che amano cucinare saranno entusiasti di tutti i giardini di verdure, fiori e piante aromatiche nonché della stufa professionale LaCanche per cucinare. Inoltre, gli ospiti possono richiedere che il pane, i dolci e la pizza siano preparati e fatti nel nostro forno da forno antico situato nei terreni del castello. Con così tanto comfort gli ospiti sono generalmente riluttanti a fare le molte cose in offerta intorno al castello, le visite turistiche, la canoa, il ciclismo, la pesca, la caccia, il nuoto, il tennis, ecc. Data la dimensione della proprietà c'è un custode che vive nella sua casa. Maidservice e catering possono essere resi disponibili anche nei mesi estivi. Il castello è anche disponibile per matrimoni, eventi, seminari, ritiri aziendali o benessere e altri eventi speciali. The Winter House, una fattoria del 17 ° secolo splendidamente ristrutturata situata sul terreno, può anche essere affittata separatamente o come un ensemble con il castello. La casa d'inverno, si trova sulla proprietà, è disponibile per il noleggio anche. Cottura, pulizia supplementare e Chauffering servizi disponibili su richiesta a pagamento. Aeroporto di pick-up e drop-off disponibili su richiesta a pagamento. Ideale per matrimoni ed eventi speciali. Chateau Beaufort is a stunning property with two long entrance driveways, and an immense stone home surrounded by 100 acres of grass, trees and grazing meadows. This home is ideal for groups of 8 to 20. The remodeled kitchen has everything you need to cater to a large group. The first floor bedrooms are spacious and well appointed and the baths are recently remodeled. The 4 bedrooms on the upper floor are less elegant and share one bath. The dining room seats 10 and the kitchen another 10. We did 1000 piece puzzles on one of the kitchen tables as it is such a gathering place. The living room is huge and seats 10 comfortably with a large screen TV and lots of books. The pool is amazing with a salt water system and lots of lounges for sunbathing. The peace and quiet of the grounds allow you to hear the songbirds singing all day. The owners (Marc and Marie) were most accomodating our needs early as we settled in and worked out some initial kinks. Their caretakers, Jon Michel and Isabel, were truly amazing and solved all our early issues with beds, plumbing and an older washing machine that was replaced. Jon Michel is also the town baker and a source of daily bread and the occasional pizza. The grounds teem with flowers that we could cut and bring into the house. An organic garden was a source of lettuce, strawberries, and green beans. We had 16 friends and 14 family members there at various times during our one month stay and everyone had a life changing experience. The owners are working on solving our one issue of excessive flies that the grazing sheep brought to the party. Overall, this is an exceptional vacation experience for larger groups and get a five star rating from our family!! This is definitely a “low key” rural location with narrow curvy roads with some distances to travel for sights and activities. The town of La Roche-Canillac is quiet, but has the Boulangerie, Pharmacy and a sweet small grocery store with a great selection of fruits, veggies and general goods. Bob Voyage!!! Le château est magnifique, propre et bien entretenu. Nous avons passé un week-end de rêve à la Roche-Canillac ! Maria et Marc sont deux hôtes particulièrement arrangeants, toujours disponibles et très sympathiques. 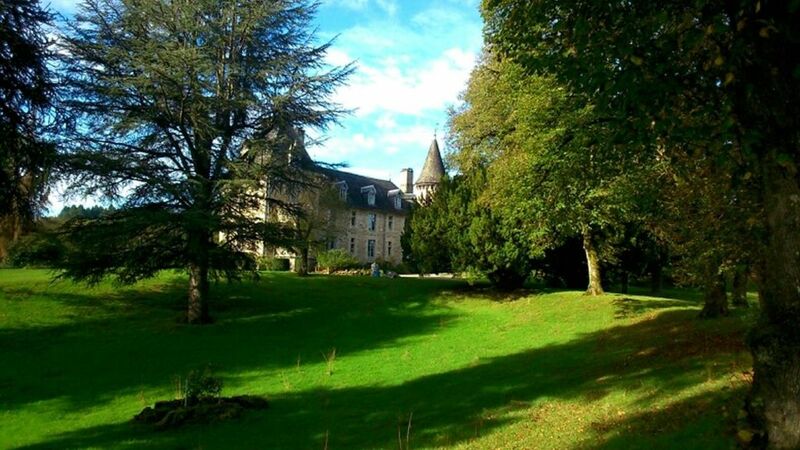 We recently had the wonderful opportunity to stay at Chateau Beaufort in La Roche Canillac, France. We decided to stay in the main house, as we were visiting with our large family and a few friends from the US. Last summer my husband and I rented the smaller "Winter House" for a romantic getaway, so we were familiar with the area and the property, and couldn't wait to return. The grounds are incredible, and you feel so secluded, perfect for a break from the chaos of the city! The caretaker, Ernest, is a kind man who was able to help us out with any small questions we had. The interior of the Chateau is refined, but also very relaxing. There are loads of great spaces to spend time in- the kitchen table, (more than enough for our large family,) sitting room with ornate tapestries, a library, and a games room (perfect for young kids AND teenagers! ), there is something for everyone. Little thoughtful extras like a high chair and plastic cutlery for babies were greatly appreciated as well. As it was winter, we were overjoyed to experience a roaring fire in the incredible fireplace in the sitting room. I honestly cannot recommend this property enough for anyone looking to get away from it all and experience the Beautiful French countryside. Nous avons été accueillis de manière tres chaleureuse dans un cadre de rêve dans ce magnifique château . Le village est aussi tres charmant , les gens , les balades , les activités . Souvenir inoubliable ! We had a brilliant2 week stay with teenage families in August. Fabulous home with exquisite furnishings and fully equipped. Ernest the caretaker was very attentive and helpful, and the owners were super responsive too. Surrounded by lakes which provided endless fun with diving boards and acres of swimming- often entirely alone! Plenty of fun at the bottom of the valley on the upper Dordogne- kayaking, standup paddleboarding, and for the adventurous , waterfall climbing with Arjen. Will definitely return! Picture perfect village of la Roche canillac- With the boulangerie in the Mairie and a well stocked epicerie- both a quick walk from the house, or even shorter bike! Pretty remote so don't expect vibrant nightlife or lots of nearby restaurants- you have to drive to find them. Lovely markets and pretty churches too. Massively recommend! A palatial residence with wonderful, stylish interior furnishings as well as large grounds. The perfect place for a family gathering with a pool and games room for kids. The hosts were very helpful as were the couple who live next door and are on hand to help as caretakers. A very verdant area with lots of walks and opportunities for water sports. It is a hidden gem!! Il Chateau de Beaufort è al centro di una delle regioni più incontaminate e meno popolate in Francia. È coperto in infinite profonde gole dei fiumi e valli, antichi foreste, laghi, fiumi, torrenti e cascate tutto scorre con le acque Topaz colorate della Correze. Torrente, fiume e lago per la pesca, la caccia, mountain bike, trekking, campeggio, orienteering, nuoto, sci nautico, tennis, vela, osservazione della fauna selvatica e moto da turismo sono solo alcune delle attività che possono essere considerate a 'Le Pays Vert' o ' Il Green Country '. Cascate, vallate fitte foreste, castelli medievali, antiche rovine e caverne sotterranee sono solo alcune delle attrazioni turistiche. Cancellation at any time results in forfeiture of the 1st payment. Cancellation 60 days or less prior to the rental period results in forfeiture of entire payment. Failure to pay on time results in rental cancellation and forfeiture of any deposited amounts. Weekly and nightly rates are on the basis of 4 guests. Please add total number of guests in order to arrive at an accurate quote for additional guests. A heating charge is applied as and when necessary and shall be paid by the guest upon arrival. This will be €33.50 per day in October and November and €42.50 per day in December, January and February. The number of days required to heat the home is the basis for the charge and not the number of days of the rental. The security deposit may increase based upon the number of guests above 4 guests. The security deposit increases by €250.00 for a pet. Please note that the Swimming pool is normally opened on June 15th but may be opened before this at an extra charge. House Rules must be strictly adhered to. These are provided upon arrival and are also posted in various locations within the residence.